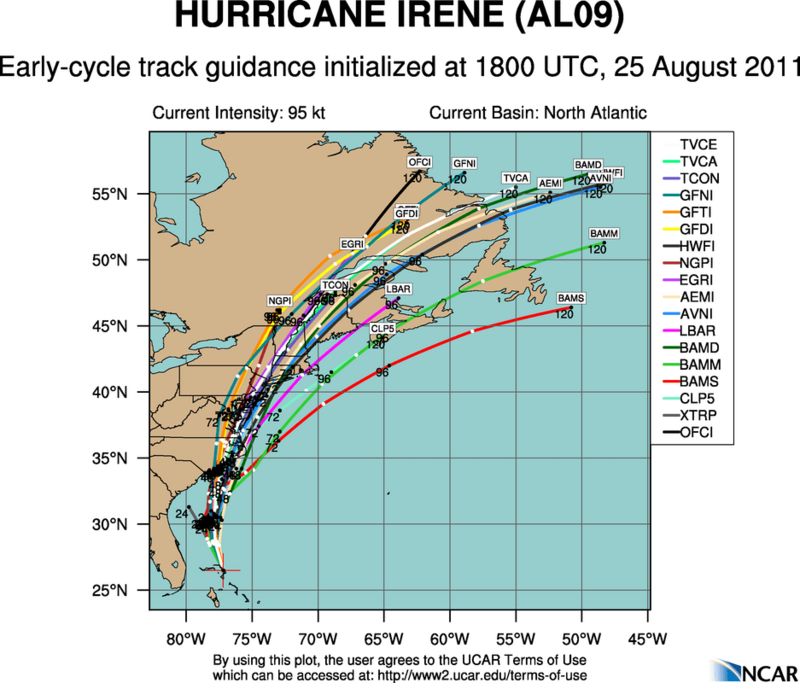 Programming note: I’m going to be writing shorter postings focused on the impacts of Irene as that is the most imminent threat and will affect a large portion of the population. Plus, that’s all most of you care about right now anyway. . .so on with the show. As you can see above, Irene is steadily approaching the Southeast U.S. this afternoon, though winds have been steady at 100 knots (115 mph), yet the pressure has fallen to 950 mb. There is still room for strengthening as it approaches the NC coast tomorrow afternoon, so don’t let your guard down. Landfall looks to be around Cape Lookout, NC, yet areas from Wilmington to Jacksonville and out to Hatteras should be prepared for high winds, very heavy rainfall, and isolated tornadoes, especially on the east side of the storm. Landfall strength looks to be around 105 knots (120 mph). Areas further north will be put under hurricane watches, including NJ up to Sandy Hook, at 5 pm. Evacuations from the barrier islands should have been started by now. It is important to be prepared, so I’m going to refer you to Ann Marie’s blog for preparation ideas. Most important is to think of water, bread, batteries, and milk. 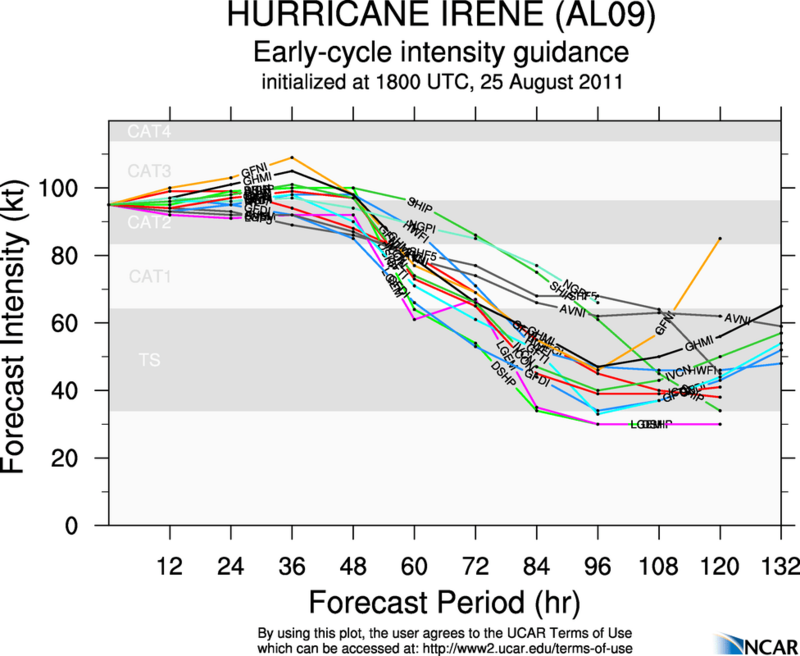 The track and intensity guidance above hasn’t changed much since the morning model runs. Of note, the 72 hour point is around the central Jersey shore and based on the intensity plots, it would be a CAT 1 to CAT 2 hurricane. This means, start preparing for winds sustained at 75-90 mph with gusts over 100 mph. Rainfall amounts will be in the 8″-12″ range with some amounts over 15″. There will also be the possibility of tornadoes, especially coastal Jersey as the storm climbs the coast. I would be prepared for tree damage due to saturated soil and power outages that could last for a few days. If possible, move your car to higher ground. Further inland from Baltimore and DC perspectives, expect windy conditions with very heavy rainfall. HPC guidance is pushing for 6″-8″ of rain with isolated higher amounts. Winds will be lower, but still could gust over 70 mph. A quick look at the 12z GFS shows the low position at 72 hours or 8 am EDT Sunday morning. At 500 mb, you can see how the trough is a bit delayed and amplified with allows the storm to stay much closer than many forecasters thought yesterday. Another interesting aspect is that this should remain tropical all the way past NYC, which is highly unusual for this far north, therefore the core of highest winds will be within the eyewall. 12z GFS forecast for 72 hours (8 am EDT on Sunday) showing the hurricane center just offshore the Delmarva. 12z GFS forecast for 72 hours (8 am EDT on Sunday) at 500 mb. The red lines are the trough axes and the green line is the ridge axis. As you can see in the 500 mb plot above, the red line to the west of the bullseye is the trough axis at neutral (lagging behind) with a second trough axis well north of the hurricane. The green line depicts the ridge axis and is the reason why the hurricane cannot move offshore and out to sea. NHC forecast as of 2 p.m. I included the 2 pm NHC update above. I won’t put up the 5 pm update as the track is just nudged slightly west from this advisory. I expect to have an update later tonight. If you have any questions or concerns, feel free to ask. Thanks for reading and get prepared if you live on the East Coast! My sister is leaving Wilmington (staying with my mom in Durham), so we can’t do the experiment to see if this hurricane is strong enough to throw a Smart car out to sea. Dang.